Upper blade is made of ceramic, and lower blade is made of stainless steel. In case that same substances are used both in upper blade and in lower blade, they cause overheating and reduce sharpness of blades.The horizontality of blades is very high, and blades are grinded with /1000mm grinder. So cutting power is very nice and life span is long compared with other companies' products. Motor RPM is 8,000 to 9,000. Generally motor RPM is 7,000 to 8,000. 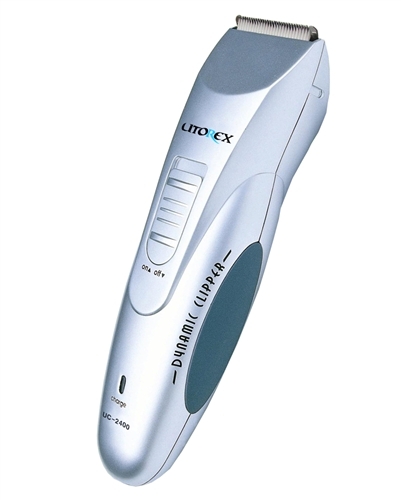 In case that motor RPM is over 8,000, it prevents damage of skin, gives smooth cutting feeling and keeps the best cutting power. The size of comb guides is more diverse than other products in order for unskilled users to adjust length of hair more diversely and easily. The sizes are 3/6, 9/12 mm. And wings are attached at the both sides of comb guides to detach comb guides more easily. Ergonomic design enables to grip the clipper conveniently, and refined design attracts customers' eyes compared with so many products made by other companies. One touch power switch is adopted to handle conveniently. the clipper is being charged.